Wedding Day Snapchat Geofilters - How To Make Your Own! 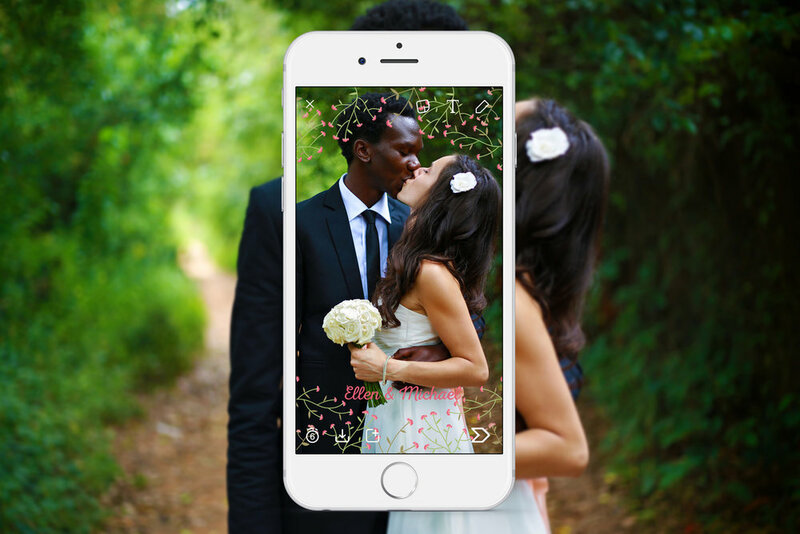 You've probably attended a wedding or event where you capture a moment on Snapchat and find that as you swipe, there is a custom geofilter you can use! This fun social media tech trend is popping up everywhere and it's surprisingly easier than you may think to create your own! Our friends at The Knot are the absolute best when it comes to creating personalized wedding websites and providing tools to help you throughout the planning process, including getting all of your social media channels on track. The site just announced the launch of their Snapchat Filter Feature, which allows couples to create personalized geofilters for all of the special events leading up to the big day, including the engagement, bridal shower, bachelor/bachelorette party and more! With a wide variety of templates and graphics, you can customize your own geofilter and maintain a cohesive theme by using your names, wedding hashtags, date and location and even fun emojis in the design. Downbeat LA loves this tool and we encourage our brides and grooms to explore their tech savviness and use it! Get started on your personalized geofilter by clicking here. For more wedding industry tips and insights, visit the Downbeat LA blog here.